Today I decided to just randomly play around with alcohol inks. 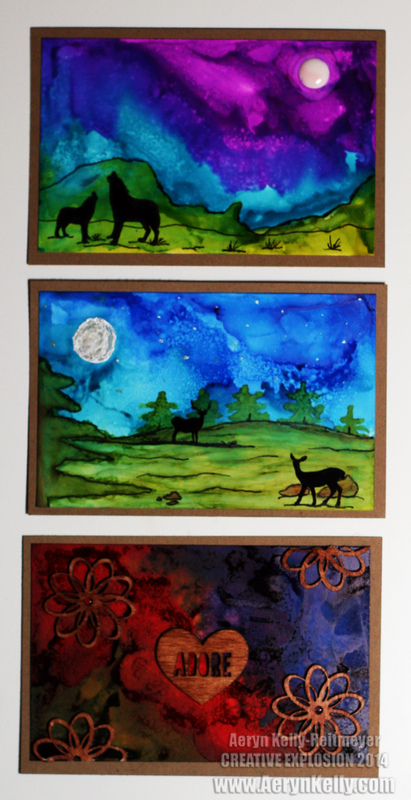 I got some photo paper, sprayed it down with rubbing alcohol, and dripped the alcohol inks on it. I then turned it around, blew on the ink, that kind of thing. The top two seemed to make a scene so I got some silhouette stamps, a multiliner pen, and drew scenes. The bottom one was just a MESS. I mean, I don't know why I thought blue, green, and red would work in this combination, but it didn't. I had to end up using two other colours to clean it up and make it more "abstract" then I tried to blah it up. I dunno. It looks weird in real life too. You can't win them all! I'm glad you are starting to feel better. The first card is my favorite, but they all look good. Very clever.